Now it seems that Lucy shared eastern Africa with another prehuman species, one that may have spent more time in trees than on the ground. A 3.4-million-year-old fossil foot found in Ethiopia appears to settle the long-disputed question of whether there was only a single line of hominins — species more closely related to humans than to chimpanzees — between four million and three million years ago. The fossil record for that period had been virtually limited to the species Australopithecus afarensis, made famous by the 3.2-million-year-old Lucy skeleton. Of perhaps more importance, scientists report in the journal Nature, published online Wednesday, the newfound foot not only belonged to a different species but also had evolved a distinctive mode of locomotion, which scientists described as “equivocal.” It clung to the trees and never adapted to terrestrial mobility outright. The Lucy species had long before evolved almost humanlike upright walking, bipedality, as attested by the Laetoli footprints in Tanzania from as early as 3.7 million years ago. This other species was still built for climbing trees and grasping limbs. It was capable of walking, though less efficiently and probably at an awkward gait. At a pivotal period in prehuman evolution, the discoverers concluded, two lines of hominins practiced contrasting locomotion behavior. Their feet, mostly, told the tale: the divergent, opposable big toe, long digits and other bones of the newfound species did not match the feet of afarensis. 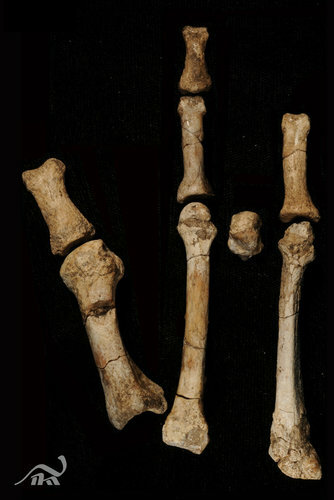 Lucy’s foot had a strong arch and the big toe was lined up with the other four digits, much like the feet of modern humans and all critical for effective bipedality, while retaining some agility for climbing trees. Yohannes Haile-Selassie, a paleoanthropologist at the Cleveland Museum of Natural History in Ohio, and his colleagues said the species the foot belonged to remains undetermined, for lack of any cranial or dental remains associated with the specimen. But they said the foot was strikingly similar to the earlier hominin Ardipithecus ramidus, nicknamed Ardi, which lived 4.4 million years ago, also in what is now Ethiopia. Ardi’s foot also had a divergent big toe, similar to those of apes and gorillas, for tree climbing, though Ardi was an occasional upright walker. Dr. Johanson, who is the founding director of the Institute of Human Origins at Arizona State University, discovered the Lucy skeleton in 1974, only 30 miles from the site of this latest find. In February 2009, at a place in the central Afar region known as Burtele, a member of Dr. Haile-Selassie’s team, Stephanie Melillo, spotted the first bone fragment eroding out of sandstone. Eventually, eight bones of a hominin foot’s usual 27 were recovered and analyzed. It was a right foot, and, there being no duplication of parts, it was thought to be from a single individual. Finding any hominin foot bones that old is rare, Dr. Haile-Selassie said. They are small and delicate, especially vulnerable to scavenging and decay.